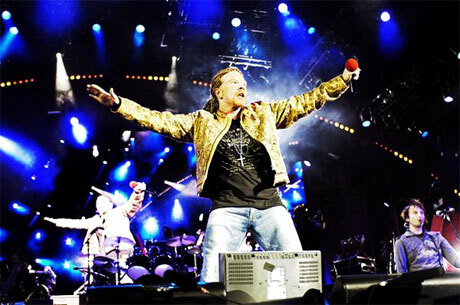 Guns N' Roses' Appetite For Touring? Gun N' Roses will apparently embark upon a world tour come March and they aren't going to stop for "at least two years," one of the band's many guitarists has revealed in an interview. Guns N' Roses' Richard Fortus let the news slip in a recent article by the St. Louis Telegraph, who were talking to the part-time GN'R member about the one-night reunion with his former band, Pale Divine. Fortus's comments follow previous hints on the official GN'R website in April, when the band said the fifth Chinese Democracy tour since 2001 was in negotiations. Giving further weight to the story, "a source close to the band" also recently told Rolling Stone that a 2009 tour was indeed in the works. Along with a world tour, Fortus made mention that Axl Rose and the gang may embark on what they are calling a "Love Tour," which would involve Guns N' Roses playing free shows in all the cities that rioted due to Axl's bad behaviour or no-show tendencies. "There has been talk of us doing a 'Love Tour,' a tour of all the cities where there have been riots, and doing free shows," Fortus said. No one from the GN'R camp has officially confirmed any tour activities in support of Chinese Democracy, nor has Axl conducted any "message board interviews" on the subject. However, if the "Love Tour" portion of the band's road trip proceeds, GN'R could play free shows in cities such as Montreal, St. Louis and Vancouver.